• Using the pattern and fabrics, plus anything else you want to add (more fabric, buttons, sequins, etc. ), you will make a Christmas stocking using your amazing imagination and creativity and bring the stocking back to Thistle Dew by Friday, November 17. 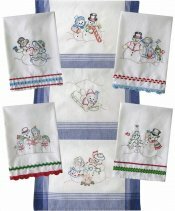 Holiday Towels - Colored & Embroidered. Join Jennifer (from our staff!) for two fun evenings of embroidery, and create some holiday gifts, too! You can choose either a snowman from Yesterday's Charm "Snow Fun" pattern or a poinsettia pattern that Jennifer will bring. In the first session, Jennifer will show you how to transfer the design to a kitchen towel and color the design (using crayons). In the second session, you'll learn to add simple embroidery outlines to create a beautiful, festive holiday towel. Jennifer Adams, Wednesday & Thursday, November 8 & 9, 5:30 - 7:30 p.m., $25 teaching fee, supply list. Christmas Card Holder. Join Dana for another great class and display your holiday greetings in jolly seasonal style. The flying-geese pockets on this tree are perfect for stashing small cards while the larger pocket at the bottom is ready to be stuffed with letters to Santa. You'll do some prep work before class, so you'll be able to complete the project in class! 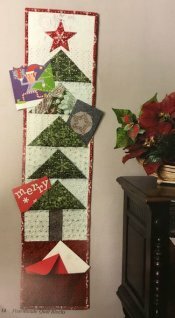 Dana Lahargoue, Sunday, November 12, 12:15 - 4:00 p.m., $30 teaching fee, supply list, including the book Five-Minute Quilt Blocks. Embroidered Pincushion. 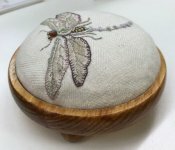 Create a beautiful and unique pincushion with Sandra Mollon. Sandra has won several national awards for her quilts, and we're happy she's teaching another class with us. She'll have several embroidery designs from which to choose, and she'll teach you many fun embroidery techniques. You can purchase a kit to turn your creation into a pincushion, or you can frame it or use it in another project. This would make a great gift! Sandra Mollon, Sunday, November 19, Noon - 4:00 p.m., $40 teaching fee, supply list. We've received lots of new fabrics, including collections for kids, flannels, double gauzes, botanical prints (from encyclopedias), batiks, blenders, widebacks, and more! We are busy making samples and kits for the holidays that we'll show you in next week's newsletter.